Wow, it is SPRING already, well technically anyways. Our weather hasn’t been great but my bulbs have started poking their green little heads up and the sap is running so we get pancakes with fresh syrup soon. I can’t believe it is already April 5 and time for another fabulous release from Doodle Pantry! 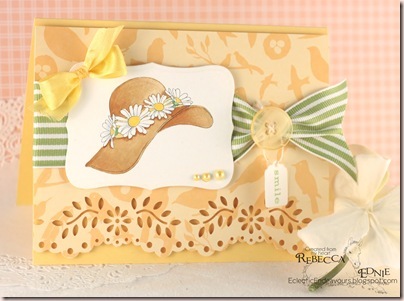 Isn’t this hat so springy and pretty!?! Click on the photo for a better look at my colouring. In case you don’t colour, this image is available PRE-COLOURED too! How nifty is that! Don’t forget, Doodle Pantry has a challenge this week too! You must use a Doodle Pantry image for the challenge and you can win a Free Image! Don’t have any images yet? Just Grab a Freebie! There are 10 available! I normally link you up to the image in the store but it isn’t up yet so you will have to wait for the release. Be sure to check out the DP blog for all of the Design Team’s AMAZING latest cards based on the FABULOUS released images. I used the latest CPS sketch; I rotated it 90 degrees then mirrored it. I really liked how much space was left at the bottom for the punched edge, I all too often add a punched edge as an after thought or at least as a middle thought and don’t leave space for this gorgeous large punch. This time I started with the punch! Click on the sketch to link to the CPS blog. Gorgeous!! What beautiful colors, paper, and border punch! Just lovely! Just fabulous! Love the ribbon and sweet little tag! Wow! How sweet! Love your coloring and that charming image! This is so pretty. 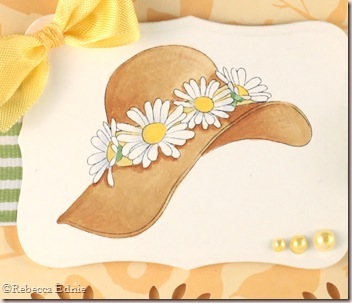 Love the brown hat with the white daisies. Your bows are perfection. wonderfully springy! Thanks for playing with us at Card Patterns! This is so pretty! Love the soft colors and layout. LOVE this! The colors are wonderful and just scream spring. 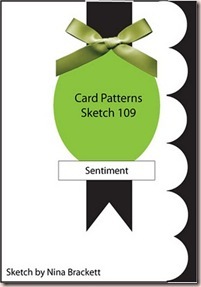 So glad that you could play along with us this week on Card Patterns! So soft and pretty! Love the subdued colors you chose and the ribbons and buttons are perfect! This is so chic! The green-striped ribbon is perfect as is your coloring. It matches your card to a tee! So beautiful; great way of doing the ribbon and wonderful colouring.Love it! Rebecca, this is soo PRETTY!! I just love that gorgeous floral punch down the edge like that, and this sketch on its side is perfect for this! =) Really Pretty! Rebecca, you have created a beautiful card! I do so love that hat! What a perfect layout – your sketch works so well!!! Great job! This is super pretty! Love how you colored the hat. Great colors. Rebecca, this is such beauty! Awesome coloring and you layout and embellishments are perfection.